In the past, it was common for dentists to use animal teeth and other people’s teeth to create dentures. Fortunately, technology and science have come a long way. Today, if you find yourself in need of a set of replacement pearly whites, you don’t have to worry about where they might have been before. 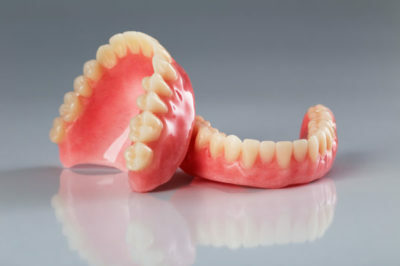 Dentures are made up of two components – the teeth and the frame. Each part is made from different materials. The most common substance used for the teeth today is a type of resin or porcelain. Typically dentists opt for porcelain because it is the most durable. Porcelain is a glass-like substance and closely resembles the appearance and feel of natural teeth. If you’re being fitted for a partial set of dentures, porcelain can be manipulated to closely match the color of your remaining teeth. The major drawback of porcelain dentures is that they can break easily. If you drop them on a hard floor it’s likely they will crack. They can also cause the wearing down of any remaining natural teeth, and for this reason, should probably be avoided for partial dentures. Acrylic resin is another popular option for denture teeth. The material used is more malleable than porcelain and allows for easy adjustment and a secure anchoring to the denture frame. Acrylic dentures are considerably lighter than porcelain teeth and cost less. One issue with acrylic teeth is that they do tend to wear out faster than porcelain teeth. Most patients will need to replace their acrylic dentures every five to eight years. The denture teeth must be supported by a frame, something that rests in your mouth and holds the teeth in place. You may have a full or partial plate or frame. The frame can be made out of three different types of material: acrylic resin, like the teeth, a nylon polymer, or a chrome cobalt metal. In order to fit you for your plate, your dentist will take an impression of your gums. They will use this mold to create a model of your dentures. Then, they will make sure the size and color are suitable before making the actual plate. Metal plates are the most durable and least likely to break; however, acrylic resin is best if you also have an artificial gum line. The acrylic resin can be treated to match the color of your gums. Your dentist can help you decide what’s best for your mouth. In order to ensure a long life for your dentures, it’s important to take care of them. You should clean them daily and make sure you keep your gums healthy enough to support your dentures. Your dentist may recommend certain products to help prevent gingivitis and bleeding.